Without the pinpoint precision of a mouse pointer, editing a few lines of text on your Windows 8 tablet seems insurmountable. How do you place the cursor in the exact location necessary to excise the unwanted text? Like nearly anything else on your tablet, it starts with a strategically placed tap. Double-tap a word near where you want to edit. Windows highlights the word, surrounding it with a small marker on each side. To extend the selection, drag the first marker to the selection’s beginning; drag the second marker to the section’s end. Sometimes double-tapping a word highlights it, but doesn’t place the markers on each side. If this happens, hold down the Shift key: As you slide your finger, Windows highlights adjacent words. 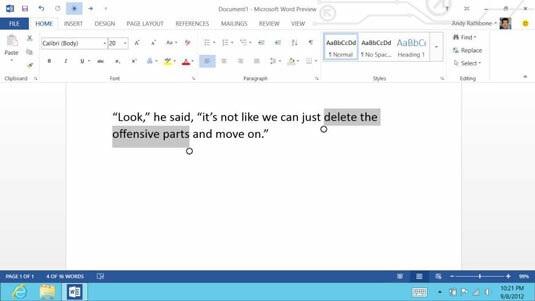 When you’ve highlighted the desired words, lift your finger and press Delete to delete them. Sometimes a tap will simply place a marker on the screen. Then you can drag the marker to the right or left until it’s at the position where you’d like to begin typing. Having trouble putting the cursor where you want it? Try zooming in with your fingers: Straddle the words with your fingertips; then spread your fingers. In many programs, the text increases in size, making it much easier to touch exactly where you want to begin typing or editing. If your tablet came with a stylus, keep it handy. You can quickly and easily mark text for changes by drawing over it with your stylus, much like using a highlighter.